Janel Brown and her son Carmine never imagined their lives could change so much in one week. The Browns attended the summer camp session at Cornerstone Campground last year and at Bradford Woods this year. Janel knew each week would be special, but she didn’t expect the shift in her life and in Carmine’s life, too. Janel heard about VLC from active VLC community member Dara Upchurch while their families were attending a Timmy Takedown wrestling event, an activity designed to celebrate kids with special needs. Dara shared her own experience with VLC, which piqued Janel’s interest. One of Janel’s favorite parts about this year’s camp session was seeing Carmine come alive and not be afraid to be himself in front of the other kids. Throughout the time at camp, Janel saw her son break out of his comfort zone, become more independent, and make more friends. She watched this happen during camp activities, nightly campfires and while Carmine played foursquare with his friends. 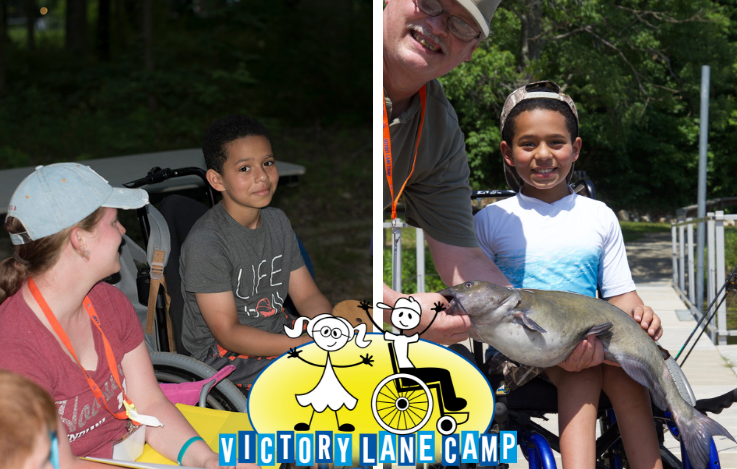 “Carmine is usually a shy kid, but when it comes to Victory Lane Camp he opens up to everyone, because they surrounded him with support and love,” Janel mentioned. One memory that Janel will cherish for a long time is when Carmine caught a huge pregnant catfish. Carmine has always enjoyed fishing and being at Bradford Woods gave him the opportunity to pursue that passion. “He was so excited when he pulled it close enough to the surface. The sheer size of that catfish sent him over the edge with excitement,” Janel explained. The connections the Browns made during the camp sessions didn’t end when camp wrapped up. They continue to stay in touch with the VLC community. Janel looks forward to continued involvement with the VLC community. And who knows what kind of catch Carmine will get next year?